You must be disappointed with the goals you conceded tonight? “When you score two goals away from home in a cup match you should be in the hat for the next round. “Yes I made three changes to the back line tonight, but in the same stretch the two centre halves were our first choice for large parts of last season. “So I wouldn’t have said we were weak by any stretch of the imagination. “But the goals we conceded tonight are unacceptable at this level. 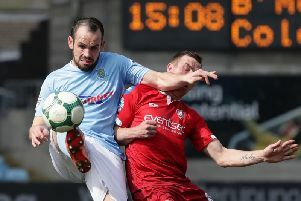 “You can’t come to Crusaders at any stage of the season and concede three goals and expect to get something out of the game. “I can legislate for an individual error, that’s football, but the first two the ease in which they get the cross away, they can pick someone out because it’s unopposed. “The second one I’m waiting for us to clear the ball but we don’t. Jamie McGonigle scored a great goal which must please you? “He was very good up here the last time we played Crusaders and again tonight he cause them no end of problems.